Everyone loves play dough, right? I even love play dough. My daughter and I can sit and play with play dough for hours without losing interest. It is one of those activities that is timeless, full of benefits and incredibly fun. Although my daughter loves learning new things, I know not every child does. 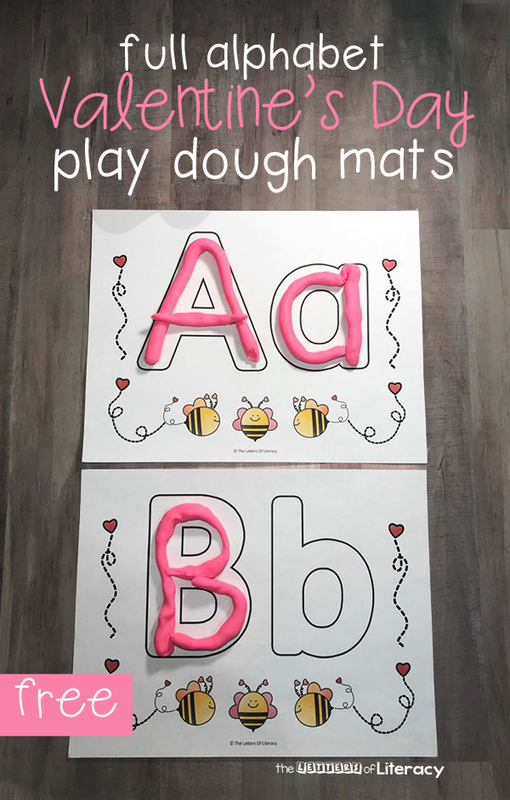 Some children require inherently fun activities with learning infused in, which these Valentine Play Dough Mats are perfect for. 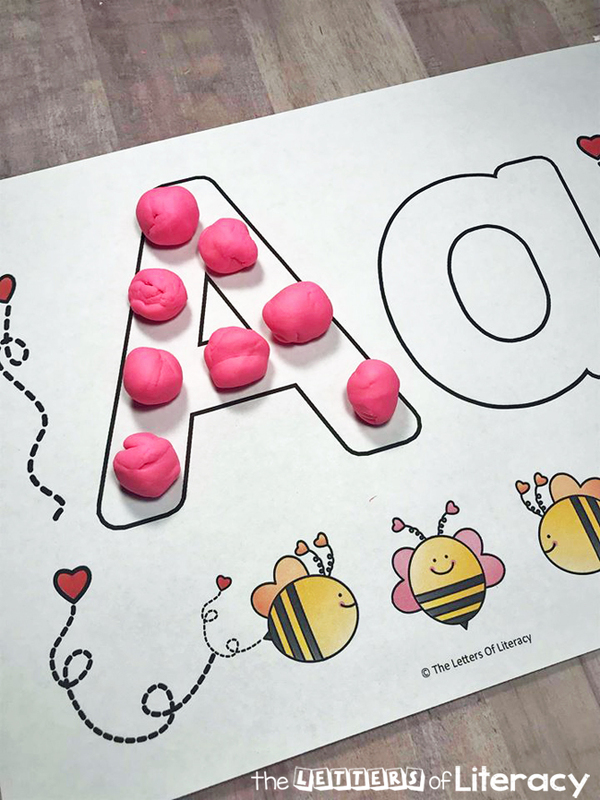 Have fun learning the alphabet this Valentine’s Day with these fun, hands-on play dough mats! 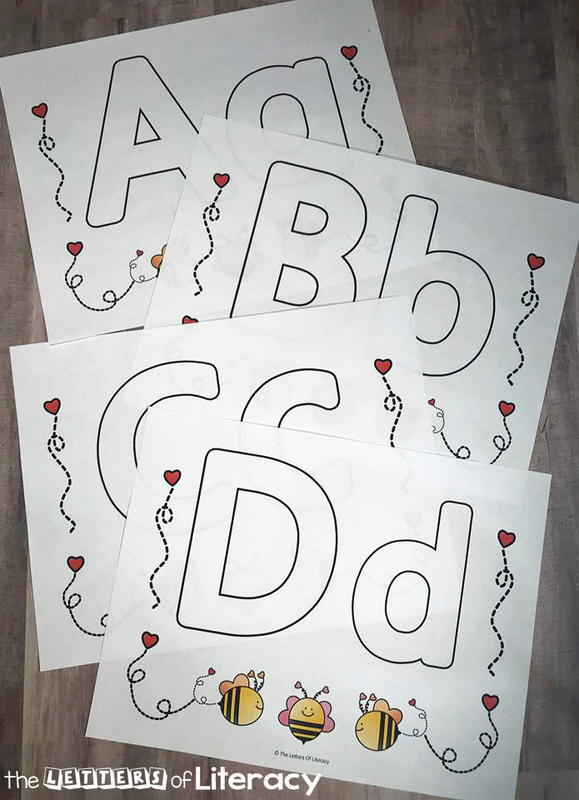 They are perfect for Preschool, Pre-K and Kindergarten classrooms. I feel like Christmas just ended, but Valentine’s Day is quickly creeping up. It is one of my favorite holidays, though, so I don’t mind. Since my daughter was born, holidays have become an extra reason to do fun things. It seems like a simple activity can be transformed into something magnificent when it has a holiday theme attached. So of course, we do holiday-themed learning activities! 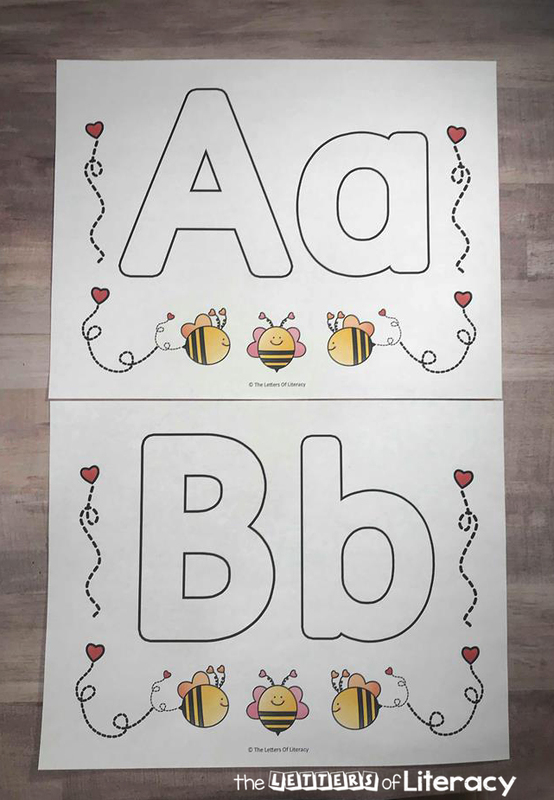 Each page of these play dough mats have fun heart and bumblebee Valentine’s Day themed pictures. 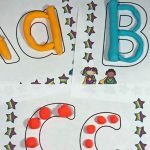 They also each have an uppercase and a lowercase letter. The pack is 27 pages and includes every letter combination. 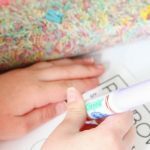 If you haven’t used printable play dough mats before, you are in for a treat. 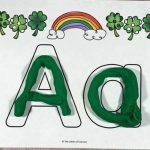 Kids will enjoy using them and you will be ecstatic over the fact that once they are ready, there is literally no prep. What I like to do is print out each page and then laminate them. I have laminated them each single paged, but I have also laminated two pages, back to back. 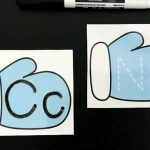 Which way you choose depends on how many kids will be using them and how often each letter will get used at one time. I like to laminate them because it makes it easy to wipe off any excess play dough without ruining the pages. Once they are laminated they will last you forever! 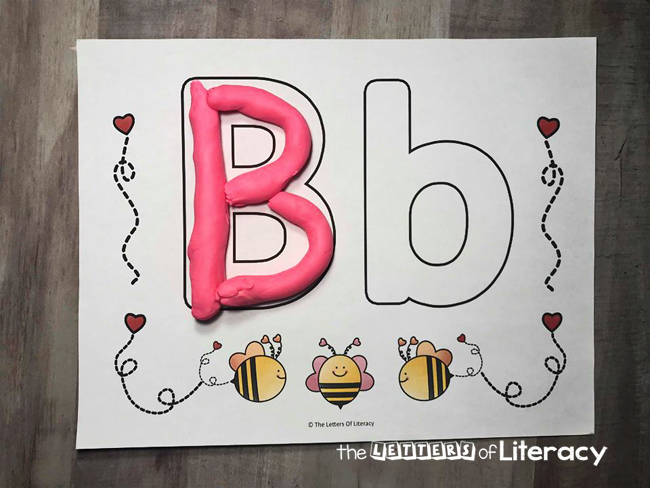 Fill the letter completely using play dough and play dough tools. 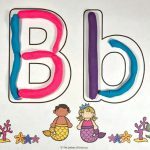 These play dough mats can also be used with dry erase markers to write the letter inside the bubble letter. As I said above, some kids need a fun factor to really be encouraged to do a learning activity. There is no shame in that, it is very common. Play dough alone is a super fun activity that most kids enjoy. These Valentine Play Dough Mats are full of fun but full of benefits. 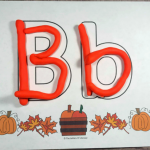 Play Dough is a fantastic way to strengthen fine motor skills, which helps with prewriting skills. 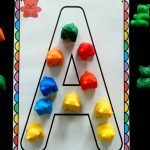 Play dough mats are a fantastic way to encourage children to practice the alphabet in a fun and hands on way. These would be excellent for centers or morning work in the weeks prior to the ‘loveliest’ holiday, Valentine’s Day. Ready to play? 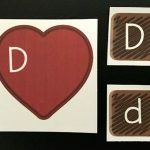 Grab some play dough, and then print your copy of the Valentine Play Dough Mats by clicking the blue button below! 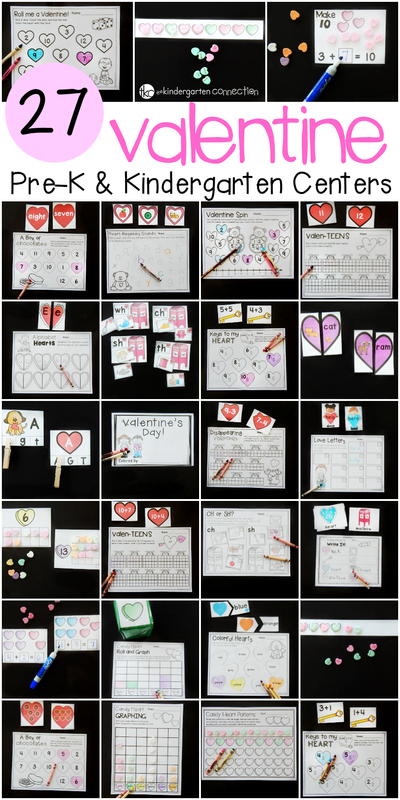 Then, for more Valentine Centers planned for you and ready to go, hop over and grab our Valentine’s Day Centers Pack!